Adelaide is blessed with a fine array of stone public statuary in the city centre and throughout its suburbs. Statues are affected by air pollution However, public art, statues and memorials, when located outside, are subject to the elements, and often become stained and discoloured as a result of traffic fumes, air pollution and being exposed to the wind and the rain. As a result, they can often be covered with a layer of grime, mould and a build up of dirt which detracts from their appearance and significance. In Adelaide, many of our finest heritage buildings and residences are located within high-density areas, and therefore they are particularly prone to suffering from traffic and environmental pollution and degradation. 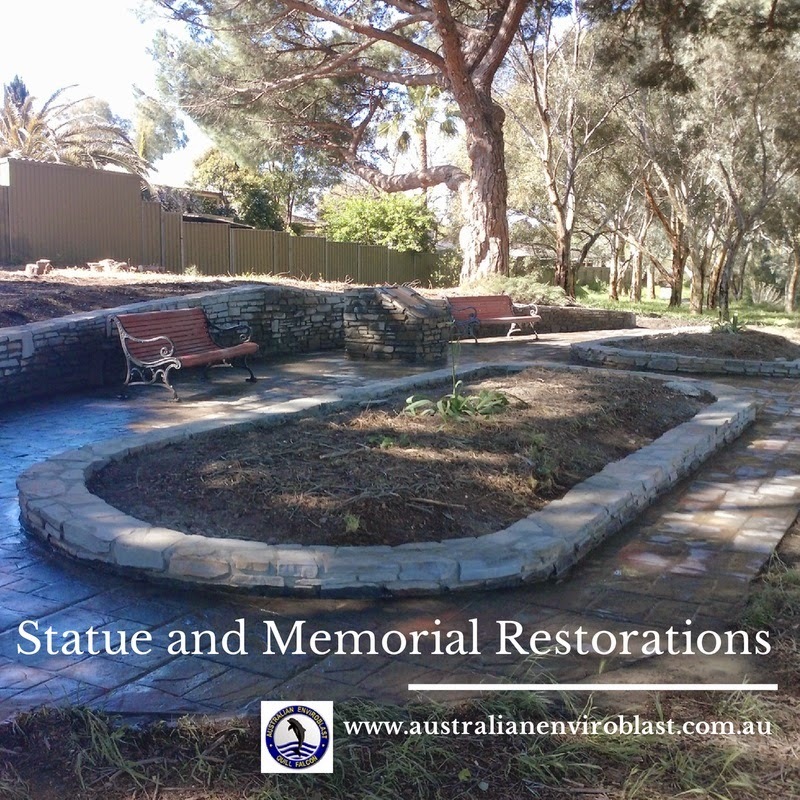 Sandstone and bluestone, historically the stones used in the majority of Adelaide buildings, can become severely discoloured and this leads not only to a deterioration in appearance but also to the overall integrity of the stone as result of decay. However, abrasive blasting using the Quill Falcon Kwikblast® Dustless Blasting System means that years of soot, grime and fumes build up can be removed quickly but without causing any damage to the surface. More gentle than sand blasting and other types of cleaning, abrasive blasting is ideal for use on softer stones like sandstone, bluestone limestone and masonry. Abrasive blasting, using the Quill Falcon Kwikblast® Dustless Blasting System, is an environmentally-friendly cleaning system that is able to remove all kinds of paint layers, coatings and corrosion from a wide variety of surfaces. It is versatile and efficient, and this makes it ideal for all kinds of renovations, both of contemporary and heritage properties. 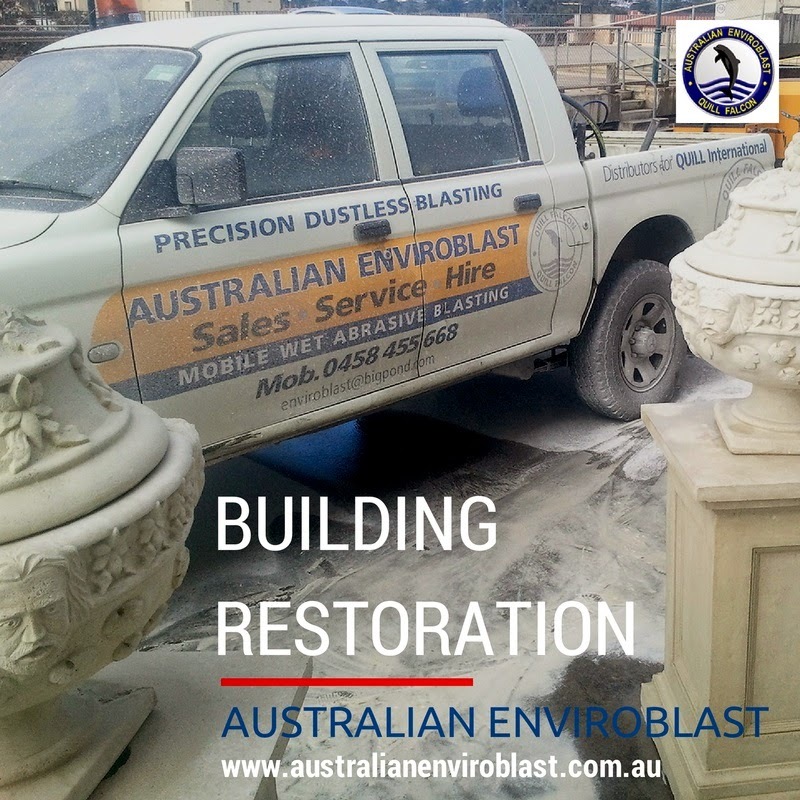 At +Australian Enviroblast we use abrasive blasting to restore properties after fire and flood damage, to remove paint from walls, to clean stained concrete, and to remove graffiti. Properties that have been damaged by fire and flood can also benefit from abrasive blasting as part of their remediation. Less labour-intensive and without involving any chemicals, damaged interiors and exteriors can be restored to a state where restoration and renovation can take place. 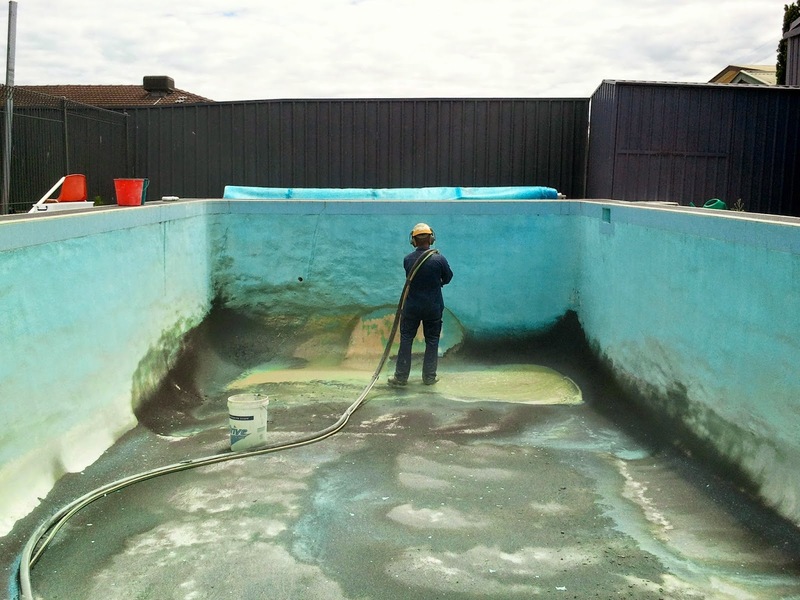 Abrasive blasting is an essential tool in a wide variety of building renovation applications. It offers a versatile, efficient, thorough but gentle cleaning process that makes it ideal in all kinds of renovation and restoration tasks. 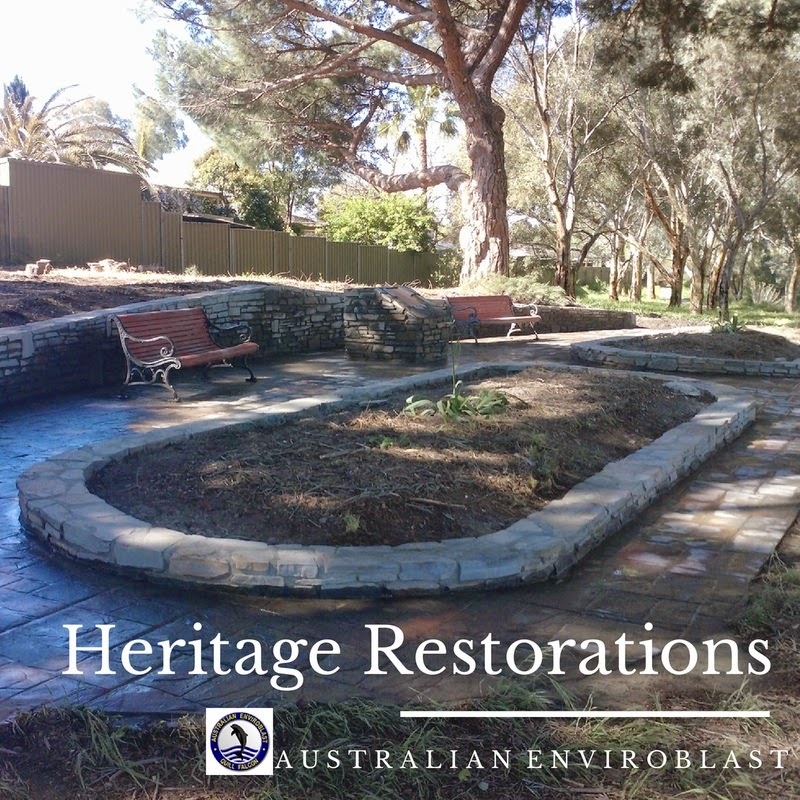 Whether stripping paint from interior and exterior walls, cleaning oil-stained driveways and car parks, removing graffiti, repairing flood or fire damage, undertaking a sensitive Adelaide heritage restoration or renovating memorials or public art works, our abrasive blasting services are the ideal cleaning and preparation solution. At Australian Enviroblast, we use the Quill Falcon Kwikblast® Dustless Blasting System, an environmentally friendly cleaning system noted for its power, efficiency and ability to remove a wide range of coatings, corrosion and residues from all types of structures, locations and equipment, leaving surfaces completely clean and contaminant free.